Renew – Refresh – Rejuvenate! Laser Creations offers a customized treatment for fresher feeling and healthier looking skin not only the face, they can be used on the neck, chest, arms and hands. 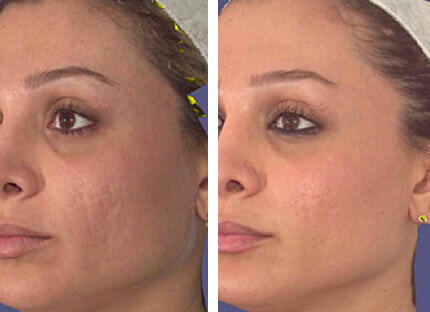 Pixel Erbium Laser Resurfacing is a state-of-the-art skin rejuvenation treatment used to smooth out scars, wrinkles, pigmentation and stretch marks. It also tightens loose skin and stimulates new collagen formation, which results in skin continuing to improve for up to 3 months after the treatment. This option can take 3-5 treatments for desired results. The pixel Laser is delivered into the skin through a micro optic lens. This creates pixel size ablative dots on the skin using 11mm x 11mm treatment zone. The depth is delivered 20 – 50 microns deep depending on type of problem skin we are dealing with. It is recommended to due up to 3 treatments spaced one month apart depending on type of conditions being treated. The pixel has minimal pain during the treatment, however post treatment feels like a sunburn on the skin. For sensitive clients we do offer numbing cream prior to treatment to minimize the sunburn feeling.